I have been MIA for long time. It feels ages since I blogged. A trip away from home and it is so difficult to get back to crafting. So much to catch up on the home front. Anyway, I have been pushing myself to craft over the weekend and was able to play with Simon Says Stamp August Card Kit. Such a gorgeous card kit and I particularly like the stamp set and the white and kraft pattern papers. They have designs that are clear embossed so when you sponge ink, the designs show up. Cool! Here is my first card using the kit. 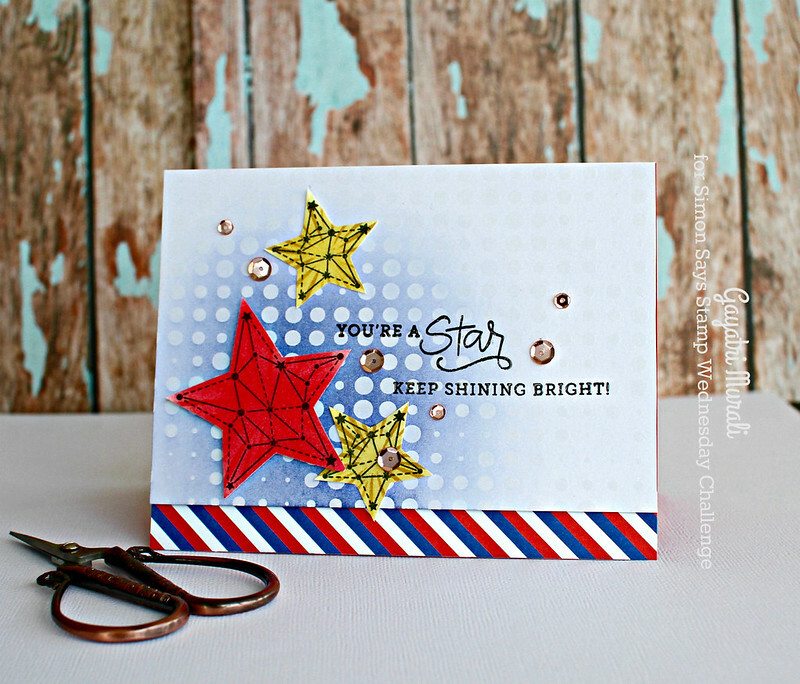 I stamped the stars from the stamp set on white cardstock using Simon Says Stamp Intense Black Ink. Then used a sponge dauber to sponge distress inks Festive Berries from the card kit and Squeezed Lemonade from my stash. 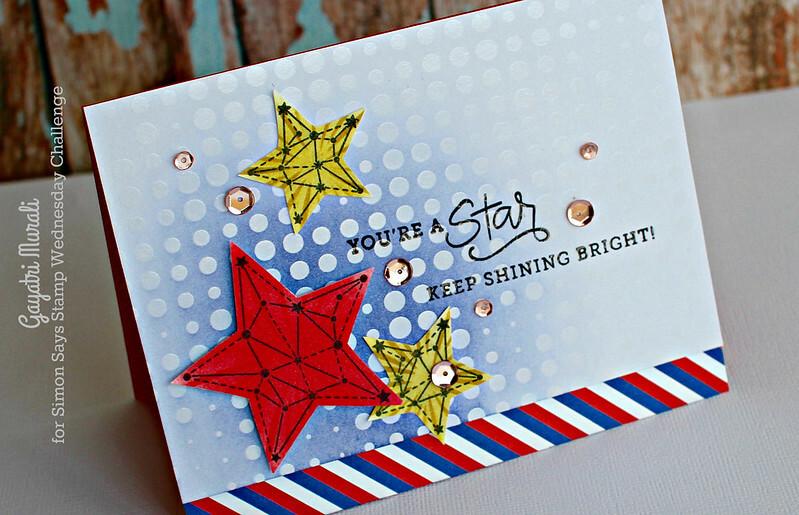 I then layered the stencil from the card kit on the stars and sponged Candid Apple and Wild Honey distress inks to add the texture of fireworks on the stars. I hand cut them all out. The background is the white clear embossed pattern paper from the kit, I sponged Chipped sapphire distress ink and look those embossed patterns pop out! I stamped the sentiment on the pattern paper using MISTI. Then assembled the card. The red, blue and white striped pattern paper is also from the kit. Finally embellished with rose gold sequins from Pretty Pink Posh. You can find more inspiration using this card kit in the gallery. This card kit is currently sold out but the stamp set, papers and distress inks are available for purchase separately! Hope you had a great break Gayatri. Lovely card.